A Buffalo homeowner and her daughter participate in the asthma intervention program through the Green & Healthy Homes Initiative. In communities like Buffalo that struggle with an aging and deteriorating housing stock as well as high poverty and unemployment rates, many children and their families are forced to live in homes that are unhealthy, unsafe and not energy efficient. These factors can contribute to serious problems such as frequent visits to the emergency room for uncontrolled asthma due to mold exposure; poor academic performance due to brain damage from lead poisoning; and increased poverty due to high heating bills. Despite the fact that these issues are all related to housing, the traditional method for addressing them relies on disparate programs with little or no coordination. 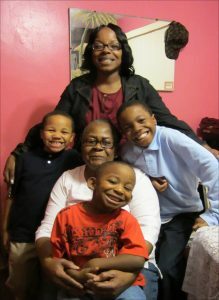 Florine, a mother, foster mother and grandmother, worked with the Green and Healthy Homes Initiative to make her 90-year-old home healthier and more energy efficient for her family. The Green & Healthy Homes Initiative (GHHI) is a model to redefine home-based health and safety funding and programs so that they are at once more effective in terms of health outcomes and more efficient in terms of cost savings. The GHHI approach also provides economic benefit to families in the form of cost savings, develops career pathways to higher-paying green jobs, and produces more stable neighborhoods by increasing the quality of housing stock. GHHI is a public-private partnership between federal, state and local governments along with national and local philanthropy. Convened locally by the Community Foundation, nine non-profit and government partners completed 402 housing interventions for homes owned by low income families across the City. This effort was supported by a $2M grant from the New York State Office of the Attorney General and matched by a coordinated system of braided funding from many sources. Now an expanded group of GHHI partners are working on the first phase of an initiative to remediate home health hazards and weatherize homes on the East Side, enabling low income families to remain in their homes. Empire State Development has supported this project with a $2M grant from the Buffalo Billion. Based on models from around the country, Buffalo’s GHHI will align and coordinate public and private funding sources and programs for weatherization, lead hazard control, asthma control, and other home health and safety interventions in low income homes. Homes with vulnerable populations such as children and seniors will be given priority. Under the green and healthy model, comprehensive whole-house solutions replace a piecemeal approach that has been based more on government silos than on the needs of children and families.